I find it hard to concentrate on my work today. 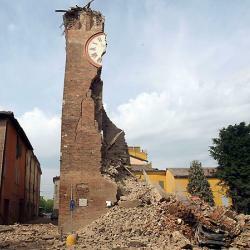 I am from Modena, Emilia Romagna, Italy, that just today has been hit by a 5.8 magnitude earthquake. I live in France, but my whole family and lots of friends are in hard-hit areas. first of all, there is Twitter itself. By now westerners have become accostumed to the uncanny speed with which online social networks, Twitter in particular, get on top of information and spread it as it happens. I know the math behind it (Twitter is a scale-free. multihub structure, extremely good for spreading information), but watching it happen is quite fascinating. In Modena today the cellular phone network went down: I learnt my own family was safe through a tweet by my sister. The hashtag #terremoto has been used to pass news around and coordinate: bring water to village X, parents of children taking part in sport event Y know that they are all safe, etc. It has even be kept free of non.operational stuff, like the emergency lane of a road closed to all traffic saved ambulances and fire trucks. As often before in comparable situations, professional journalists are reduced to updating their websites based on… Twitter. second, as the phone network failed and the need for communication was very urgent, people quickly figured out they could create a rough-and-ready data communication network simply removing the passwords that prevent unauthorized users to connect to the wi-fi hotspots in their homes, shops and offices. Citizens, businesses, local authorities and at least two telecommunicatioin company with a commercial wi-fi offer (TIM and Vodafone – here is the latter’s instructions) all did this. The suggestion and the instructions to reconfigure hotspots is being spread through Twitter and Facebook as I am writing this. In densely populated cities like Modena, this means a more or less complete coverage. For free, and in minutes. third, thousands of people were made temporarily (and in some cases, unfortunately, more than that) homeless, as their homes need to be checked for damages by technicians. The Couchsurfing network sprung into action, asking its members to post onto a specific web page whether they were willing to take on evacuees, and for how long. Immediately several pages of offers shot up. Many list a duration of “as long as they need to”. For those who don’t know it, Couchsurfing is a network of predominantly young adults who share their couches or guest rooms: it is a way to travel to a distant city and not only save the money of a hotel room, but also have a local that they know. commons are in the eye of the beholder. All of those wi-fi routers were there before. It’s just by looking at them in a new way and thinking “Hey, if I open up my wi-fi my neighbor will be able to inform her family in a distant city that she’s all right; plus, if we all do it,. will be able to compensate for the telephone network’s failure.” instead of “I need to keep my wi-fi protected from free riders or, worse, pirates” that the common good is created. Internet culture is conducive to creatng and maintaining commons. There is no going around it: all three phenomena (and many others) are intimately related to the Internet: enabled by its existence and consistent with hacker “do it yourself” ethics. There may be a third one, but it is not very scientific: the seeming ease with which my countrymen and -women adopted such sharing behavior is a harbinger of hope. Looking forward to what comes next. This entry was posted in complexity economics, Internet, social innovation and tagged beni comuni, commons, complexity economics, condivisione, Emilia, Modena, sharing, terremoto on 29 May 2012 by Alberto. On the road again. This time I am going to a birthday party: we celebrate the twentieth birthday of the World Wide Web. The date: Monday, November 14th. The location: Rome, Hadrian’s Temple. The guest of honor: sir Tim Berners-Lee, the Web’s proud father, who will deliver the keynote speech. 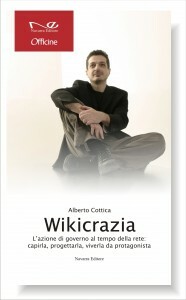 Much more modestly, I too will hold a short talk about Wikicrazia, i.e. collaborative, Internet-mediated governance. In the foreground, the party; in the background, difficult times for Italy. But they only make the celebration more necessary: nobody dare take it from us! As Saint Augustine wrote sixteen centuries ago, we are the agents of the times: if we don’t like them, we can always invent new times, or at least try to. A growing number of Italian citizens, connected by the web, is doing just that. I am trying to do my bit, too: Wikitalia – we will talk about it on Monday – is exactly that, Italy’s birthday present to the Web, and the Web’s to Italy. This entry was posted in Internet, Open government, Wikicrazia and tagged HBW, Tim Berners-Lee, Web, Wikicrazia on 13 November 2011 by Alberto.